We're currently aware that last year's antiqued Golden Harvest Festival's crafting materials are able to be placed on the Marketplace regardless of their duration expiring. We're currently in discussions with the development team on addressing this issue. The 2017 items will not be usable for this year's Golden Harvest Festival so please take extreme caution when purchasing the 2018 event items from the Marketplace and ensure that the item's duration has not expired before completing your purchases. Perhaps testing content, before releasing it, would alleviate some of these issues (eg Gunner F2 not working, expired items that can be sold on the market, etc). Maybe it's better to remove those old items than removing blue quests. Maybe it's better to not use new items (item ids) every event. It's messy coding and, as this is not the first time expired items were an issue during an event, makes these problems more probable. Anybody selling expired items oughta be whacked with the ban stick. 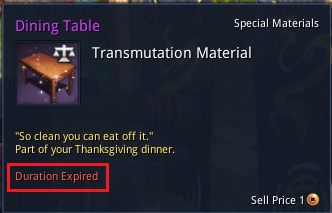 Which is why all expired items should be automatically deleted after the given date. That way it automatically frees up the ID to be used again. This game's size is massive due to the amount of items that are backed up within the game's database. Yeah this game needs a item purge during maintenance as there are items in the store/ marketplace, that do not serve a purpose for anyone and are just taken up space... but thanks for the heads up. Viewers discretion is advised. Can't complain when the warning is there though. to bad many players do not look at forums, and many who do, do not spread the word. what they should do is send a in game letter to every one. 2 ways to do that idea, either actual mail or scroll in quest tab. either way would get the word out there faster and make it so no player can try and pull a fast one on dev's by playing the dumb dumb card saying they didnt know, or never got word about something.